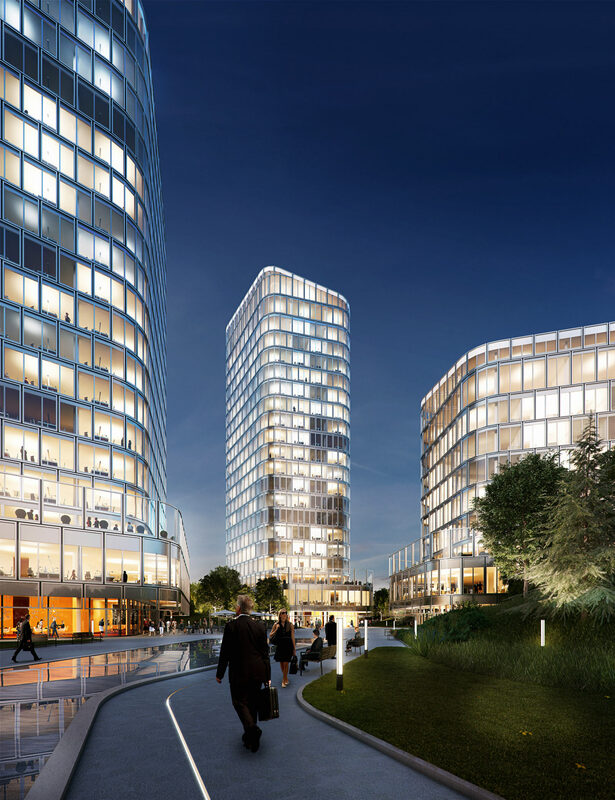 The future is starting right here, right now: Bavaria Towers, Munich’s most forward-looking real-estate development, looks set to redefine the east of the city and create a striking new gateway to the Bogenhausen district. Ideally located, the building ensemble is comprised of four spectacular high-rises with inclined roofs and gently curved forms, which make a striking addition to the Munich skyline. The mix of three office towers and a hotel offer the perfect environment for discerning companies looking for stunning architecture, premium fixtures and fittings, and a high-end look and feel – with a first-rate infrastructure to boot. Covering a total area of approx. 23,000 square metres, the plot is the property of Bogenhausener Tor Immobilien GmbH, jointly owned by the Von der Heyden Group and an institutional investor. The Munich-based development company Bayern Projekt GmbH is tasked with project development and representing the interests of the owners. Bavaria Towers makes an architectural statement that will be felt far beyond the city where it is located. In and of themselves, each of the four towers is a design triumph: featuring a pentaganol floor plan, a slightly inclined mono-pitch roof, and a two-storey base building with a layout extending beyond that of the structure above. Together, they form a harmonious ensemble; a striking landmark that truly is one of a kind. A central plaza between the towers is home to a selection of eateries, attractive green spaces and water features – drawing tenants to this outdoor space and inviting them to stay a while. With its soft, flowing lines and transparent facades, the ensemble creates a striking impression from all angles. By keeping the slightly inclined mono-pitch roofs free of any additional structures, the seamless continuity of the innovative design language is maintained. The architectural concept aims to counterbalance the complexity of the structures through recurring elements and variations on a theme. The pentagon is a shape often found in nature – in the formation of mineral crystals, for example. Intelligent elongation of selected sides of the floor plan maintains the basic pentagonal shape throughout while allowing visual proportions to vary, creating a unique architectural gem. Few international architects have made a name for themselves as quickly as Fuensanta Nieto and Enrique Sobejano. With offices in Madrid and Berlin, the star duo from Spain already have an impressive portfolio of renowned international projects under their belt – from museums in their home country to plans for entire city districts in China. Their Munich office is currently working on the renovation of the Königshof Hotel. Many of the couple’s award-winning designs aim to integrate contemporary architecture into complex urban contexts. Bavaria Towers will be another fine example: the striking silhouette of the ensemble will beat a new path, while still slotting seamlessly into its surroundings. The towers’ organic shapes and striking façades represent the very best modern design has to offer, creating a welcome exception to the everyday monotony of conventional utilitarian architecture. Sky Tower is the highest building in the Bavaria Towers ensemble. A spectacular roof terrace on the nineteenth floor provides a fabulous panorama view over Munich and beyond to the Alps. At a height of 83.6 metres, it is one of the tallest structures in the city and can be seen for miles around. Standing proud at the heart of Einsteinstrasse, it will be the first building that millions of visitors to the metropolis see when arriving from the east. Located in the centre of Einsteinstrasse, the 72.3-metre-high Blue Tower is set to become a key landmark on the eastern periphery of Munich. Those working in the offices on the upper floors will enjoy an unparalleled view over the city and across to the foothills of the Alps. The property is ideal for companies wishing to combine a central location and first-rate transport links with an upmarket look and feel. A real highlight is the large terrace on the second floor: a great spot to escape to and unwind, offering an attractive view of the surrounding greenery. It may be the smallest property in Bavaria Towers, but it still exceeds even the highest standards. Boasting silver-level DGNB certification and a spectacular roof terrace on the eighth floor, it is the perfect choice for any firm that wants a forward-looking building with a high-end look and feel. The tower forms the north-east corner of the complex, meaning it is set back somewhat from the busy main roads A94 and Einsteinstrasse – tranquil yet still at the heart of the action. Boasting a striking metallic façade, White Tower stands out from the rest of the complex and creates an exciting visual contrast to the other glass building fronts. All rental space in the tower has already been snapped up, with a business superior Hyperion-Hotel is set to open in the building in 2018. Guests from all over the world will stay in its 345 rooms and panorama suites, and enjoy a variety of restaurants and al fresco dining options. 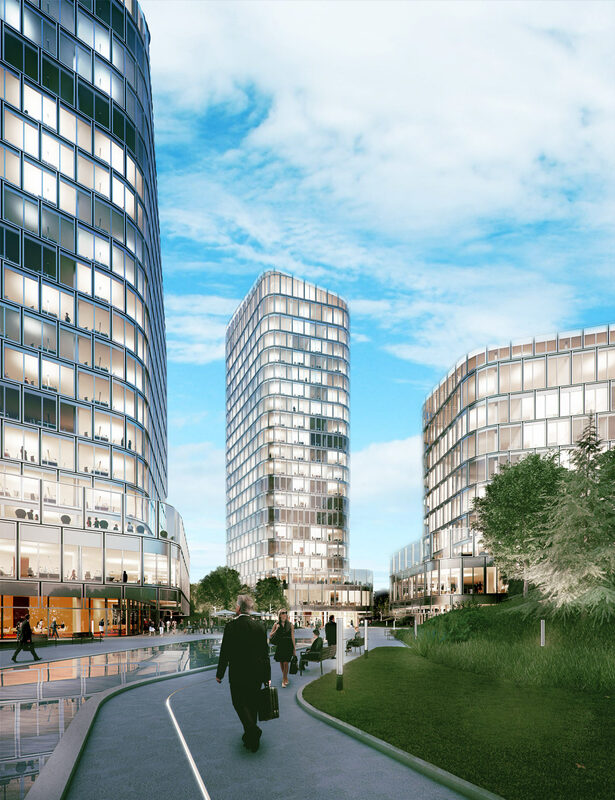 Situated in the Bogenhausen district on the eastern edge of Munich, Bavaria Towers creates a stunning new gateway to the city – offering businesses a unique opportunity to claim a spot on one of the major thoroughfares into the regional capital. With its own tram stop and direct access to the A94 motorway and B2R ring road, this ideal location can be accessed quickly and easily from all directions. With transport links like these, Bavaria Towers is the perfect base for major corporations and mid-sized companies looking to make their mark on the south-German city. It is the capital of Bavaria, an international hub for the automotive, IT and services industries, and a hotspot for trade fairs of all kinds – no wonder Munich is regarded as one of Europe’s most attractive urban centres. The “metropolis with heart”, as it is affectionately known, offers an unparalleled environment for doing business, and is a true melting pot attracting top companies from all sectors and all parts of the globe. Moreover, it is home to Germany’s second-largest airport, from which passengers can travel to and from over 240 destinations worldwide. And the city’s main train station offers rapid and easy access to major European cities such as Vienna, Milan, Frankfurt and Berlin. Surrounded by rolling Bavarian countryside and in the shadow of the Alpine foothills, Munich offers its inhabitants an enviable quality of life – combining a strong economy with the Bavarian joie de vivre. Conveniently located on the way into the Bogenhausen district in eastern Munich, all of Munich’s major destinations can be reached from Bavaria Towers in no time at all. Direct access from the complex to the A94 means the Messe München trade fair centre and the A99 ring motorway are close at hand. And with the commuter rail and underground stations just a few minutes’ walk away, those working in and visiting the complex can easily get around Munich by public transport, too. By the time the development is finished, Bavaria Towers will also have its own tram stop. Einstein shopping centre 1 Min. Käfer fine foods store 5 Min. Messe München trade fair centre 7 Min. Main train station 15 Min. Bavaria/Wiesn festival grounds 17 Min. An eye-catching metallic façade, spectacular views over the city, excellent transport links in all directions – little wonder that the Hyperion Hotel in Bavaria Towers is in line to be Munich’s new hotel hotspot once it opens in 2018. And the fact that business travellers can enjoy the superb facilities on offer is another great benefit for companies based in the building ensemble. Whether for a business trip, a board meeting or just a coffee break – the full-service offering of the Hyperion-Hotel meets and exceeds expectations. A range of food and drink options in a number of restaurants and the bar, together with 345 luxury rooms and panorama suites ensure an enjoyable and relaxing stay. Plus, a large spa and fitness area on the 14th floor provides the perfect opportunity to unwind. Moreover, this four-star hotel features a conference and event facility covering around 700 square metres. This makes the Hyperion-Hotel in the Bavaria Towers ideal for events of all kinds – 24 hours a day, 7 days a week, 365 days a year. Tomorrow starts today – the fixtures and fittings in Bavaria Towers do full justice to the vision that inspired the development, combining leading-edge materials, minimalist design, and state-of-the-art building systems. The ensemble offers the perfect environment for innovative enterprises, supporting tomorrow’s world of work. There are two central underground parking garages with a total of 798 spaces, and every tower boasts its own driveway and a large, spacious lobby. High-speed elevators take you directly to the office floors, which can be designed in line with any conceivable usage concept: from individual to open-plan offices, or a combination of both. Moreover, full-length windows and a floor-to-ceiling height of three metres lend a roomy, airy feeling to the rental units. And the upmarket design is rounded out by premium features such as external solar protection and openable window elements. Bavaria Towers is the epitome of sustainable design, embodying an end-to-end energy efficiency concept – from the double-skin façade structure to the district heating system. The buildings are set to achieve silver-level DGNB and/or gold-level LEED certification. Breathtaking, mesmerising, one of a kind – Star Tower’s spectacular roof terraces are one of the real highlights of Bavaria Towers, providing an impressive panorama view over Munich and the Alps beyond. Located on top of the base building and on the tower roof, the terraces offer the perfect location for unforgettable receptions and events in a unique setting. Floor-to-ceiling glass panels guard against the elements, ensuring a pleasant environment whatever the weather. We are very delighted that you have shown interest in our enterprise. Data protection is of a particularly high priority for the management of the Bayern Projekt GmbH. The use of the Internet pages of the Bayern Projekt GmbH is possible without any indication of personal data; however, if a data subject wants to use special enterprise services via our website, processing of personal data could become necessary. If the processing of personal data is necessary and there is no statutory basis for such processing, we generally obtain consent from the data subject. The processing of personal data, such as the name, address, e-mail address, or telephone number of a data subject shall always be in line with the General Data Protection Regulation (GDPR), and in accordance with the country-specific data protection regulations applicable to the Bayern Projekt GmbH. By means of this data protection declaration, our enterprise would like to inform the general public of the nature, scope, and purpose of the personal data we collect, use and process. Furthermore, data subjects are informed, by means of this data protection declaration, of the rights to which they are entitled. As the controller, the Bayern Projekt GmbH has implemented numerous technical and organizational measures to ensure the most complete protection of personal data processed through this website. However, Internet-based data transmissions may in principle have security gaps, so absolute protection may not be guaranteed. For this reason, every data subject is free to transfer personal data to us via alternative means, e.g. by telephone. The data protection declaration of the Bayern Projekt GmbH is based on the terms used by the European legislator for the adoption of the General Data Protection Regulation (GDPR). Our data protection declaration should be legible and understandable for the general public, as well as our customers and business partners. To ensure this, we would like to first explain the terminology used. The website of the Bayern Projekt GmbH collects a series of general data and information when a data subject or automated system calls up the website. This general data and information are stored in the server log files. Collected may be (1) the browser types and versions used, (2) the operating system used by the accessing system, (3) the website from which an accessing system reaches our website (so-called referrers), (4) the sub-websites, (5) the date and time of access to the Internet site, (6) an Internet protocol address (IP address), (7) the Internet service provider of the accessing system, and (8) any other similar data and information that may be used in the event of attacks on our information technology systems. When using these general data and information, the Bayern Projekt GmbH does not draw any conclusions about the data subject. Rather, this information is needed to (1) deliver the content of our website correctly, (2) optimize the content of our website as well as its advertisement, (3) ensure the long-term viability of our information technology systems and website technology, and (4) provide law enforcement authorities with the information necessary for criminal prosecution in case of a cyber-attack. Therefore, the Bayern Projekt GmbH analyzes anonymously collected data and information statistically, with the aim of increasing the data protection and data security of our enterprise, and to ensure an optimal level of protection for the personal data we process. The anonymous data of the server log files are stored separately from all personal data provided by a data subject. The website of the Bayern Projekt GmbH contains information that enables a quick electronic contact to our enterprise, as well as direct communication with us, which also includes a general address of the so-called electronic mail (e-mail address). If a data subject contacts the controller by e-mail or via a contact form, the personal data transmitted by the data subject are automatically stored. Such personal data transmitted on a voluntary basis by a data subject to the data controller are stored for the purpose of processing or contacting the data subject. There is no transfer of this personal data to third parties. Each time the component “Google Maps” is accessed, Google places a cookie to process user settings and data when the site into which the component “Google Maps” has been integrated is viewed. Closing the browser will usually not delete this cookie. Instead, and if not manually deleted before by you, it expires after a certain period of time. If one of the aforementioned reasons applies, and a data subject wishes to request the erasure of personal data stored by the Bayern Projekt GmbH, he or she may, at any time, contact any employee of the controller. An employee of Bayern Projekt GmbH shall promptly ensure that the erasure request is complied with immediately. Where the controller has made personal data public and is obliged pursuant to Article 17(1) to erase the personal data, the controller, taking account of available technology and the cost of implementation, shall take reasonable steps, including technical measures, to inform other controllers processing the personal data that the data subject has requested erasure by such controllers of any links to, or copy or replication of, those personal data, as far as processing is not required. An employees of the Bayern Projekt GmbH will arrange the necessary measures in individual cases. the Bayern Projekt GmbH will arrange the restriction of the processing. In order to assert the right to data portability, the data subject may at any time contact any employee of the Bayern Projekt GmbH. The Bayern Projekt GmbH shall no longer process the personal data in the event of the objection, unless we can demonstrate compelling legitimate grounds for the processing which override the interests, rights and freedoms of the data subject, or for the establishment, exercise or defence of legal claims. If the Bayern Projekt GmbH processes personal data for direct marketing purposes, the data subject shall have the right to object at any time to processing of personal data concerning him or her for such marketing. This applies to profiling to the extent that it is related to such direct marketing. If the data subject objects to the Bayern Projekt GmbH to the processing for direct marketing purposes, the Bayern Projekt GmbH will no longer process the personal data for these purposes. In addition, the data subject has the right, on grounds relating to his or her particular situation, to object to processing of personal data concerning him or her by the Bayern Projekt GmbH for scientific or historical research purposes, or for statistical purposes pursuant to Article 89(1) of the GDPR, unless the processing is necessary for the performance of a task carried out for reasons of public interest. In order to exercise the right to object, the data subject may contact any employee of the Bayern Projekt GmbH. In addition, the data subject is free in the context of the use of information society services, and notwithstanding Directive 2002/58/EC, to use his or her right to object by automated means using technical specifications. If the decision (1) is necessary for entering into, or the performance of, a contract between the data subject and a data controller, or (2) it is based on the data subject's explicit consent, the Bayern Projekt GmbH shall implement suitable measures to safeguard the data subject's rights and freedoms and legitimate interests, at least the right to obtain human intervention on the part of the controller, to express his or her point of view and contest the decision. If the data subject wishes to exercise the rights concerning automated individual decision-making, he or she may, at any time, contact any employee of the Bayern Projekt GmbH. If the data subject wishes to exercise the right to withdraw the consent, he or she may, at any time, contact any employee of the Bayern Projekt GmbH.